Looking for awesome food and drink in Scotland? You’ll find it harder not to find great food and drink in Scotland. I visited Scotland back in 2015 which was Scotland’s year of food and drink. There was an extra special focus all over the country on all the fantastic produce that Scotland creates. Without a doubt, Scotland produces fine tasting food. 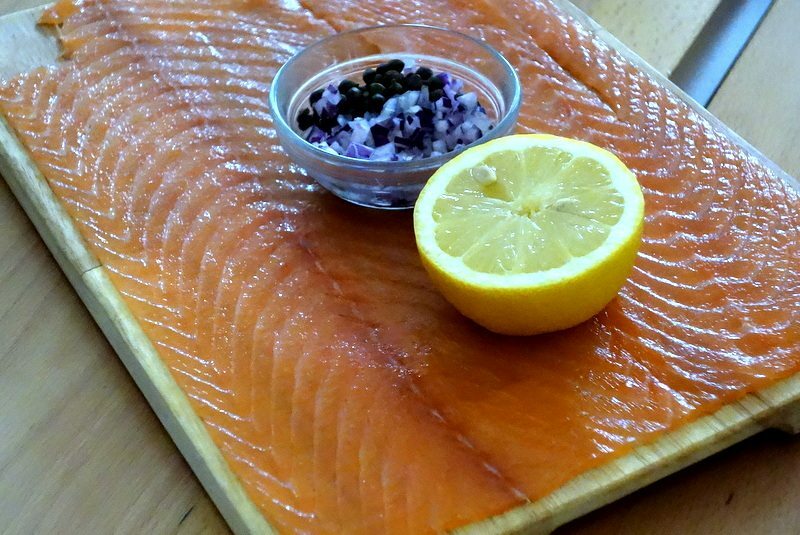 Delicious fresh fish, from Scottish smoked salmon to Loch Fyne oysters, juicy Aberdeen Angus to Haggis and hearty neeps and tatties. Scotland’s cuisine is a lot more than the deep fried Mars Bars it’s sometimes associated with. With the Slow Food movement spreading throughout the country, and emerging chefs with a real passion for what they do, visitors to Scotland are beginning to uncover the great Scottish food that the Scots have known about for decades. 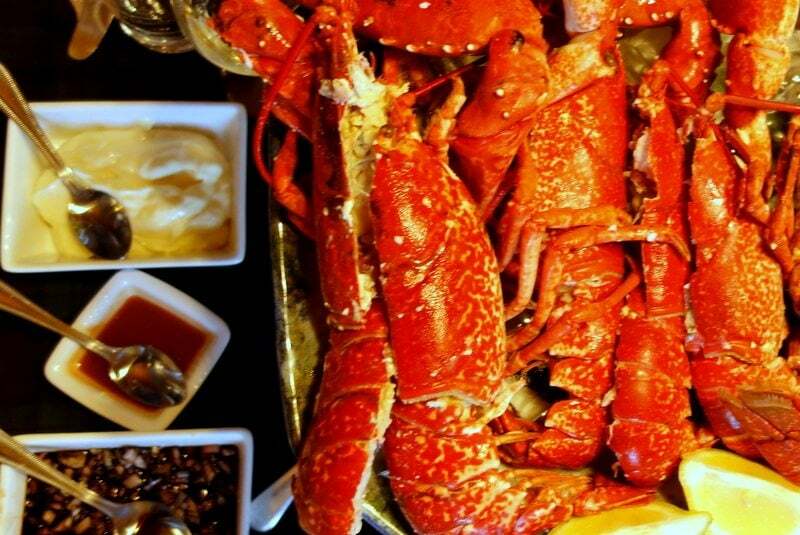 We found some of the best food and drink in Scotland’s west coast. It started with lunch in one of the most picturesque locations I’ve ever eaten anything: the tree house at The Lodge on Loch Goil. 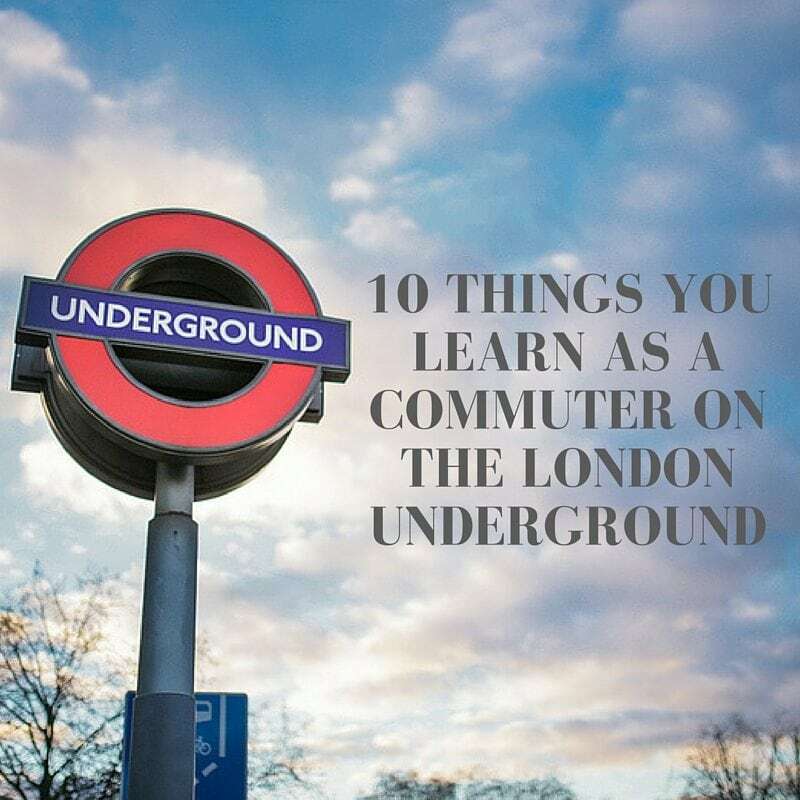 Want more Scotland travel ideas? 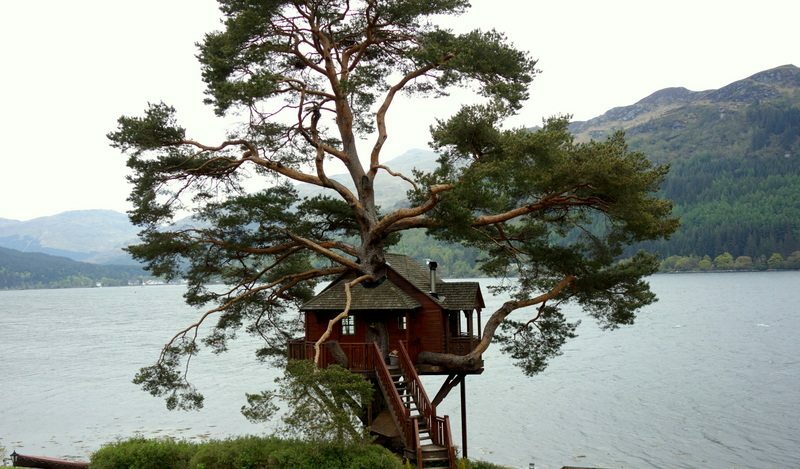 On the shores of Loch Goil is a very special place: The Lodge. The Lodge is a 5-star exclusive-use venue which specialises in intimate weddings, fashion shoots and luxurious getaways. 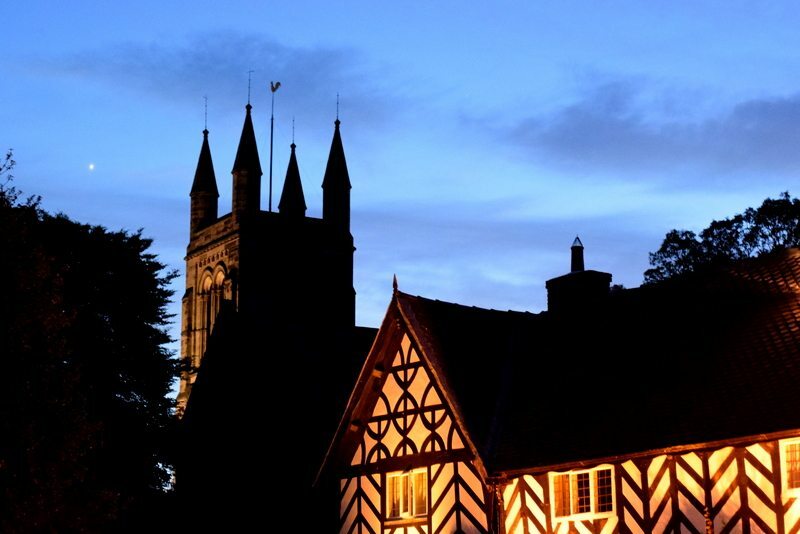 The main building was built in 1864 by William Leiper and has since been lovingly restored to house the UK’s largest collection of Arts & Crafts furniture. I never knew what Arts & Crafts was before my trip to Scotland’s west coast, but rest assured it’s beautiful. With seven luxury bedrooms, an impressive sitting room, cosy whisky bar and a dining room with original stained-glass windows by Daniel Cottier, hand-painted wallpaper and parquet floors, The Lodge is undoubtedly a very special place. Most importantly, they serve incredible food. 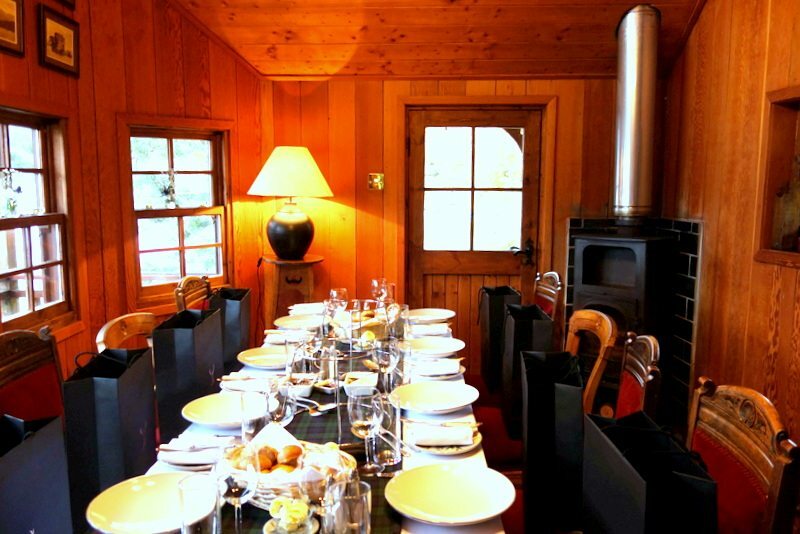 Overlooking the calm, clear waters of Loch Goil, the rustic tree house, with its wood burning stove, was made even more impressive by the food. The chefs at The Lodge pay close attention to every detail, ingredients are locally sourced, organic and seasonal wherever possible. The Lodge even uses herbs, fruit and vegetables from their own garden. We were served a similar menu to the one served on the eve of a wedding. Fortunately, I discovered oysters to be pretty tasty. Just as well as the seafood available in Scotland is among some of the best you’ll find anywhere and we were set to eat a lot of it over the next three days. 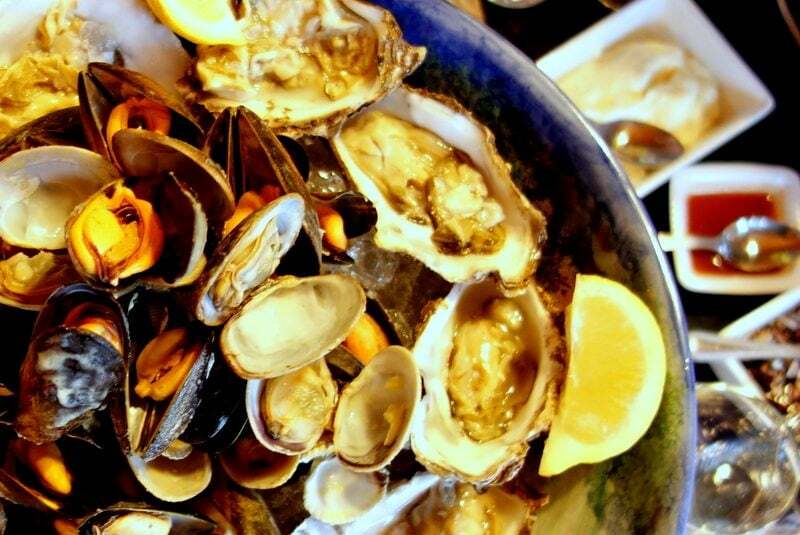 First up were dishes piled high with oysters, mussels, clams, huge lobsters and fresh bread. My first experience of oysters was during this trip to Scotland. Mains (as if we needed them after all that food) were salmon, trout from the Loch, carrots, potatoes and chicken; to make is both surf and turf. To celebrate Scottish food on our first evening we took to the streets of Glasgow’s west end to eat at several Glaswegian institutions on a dish crawl. 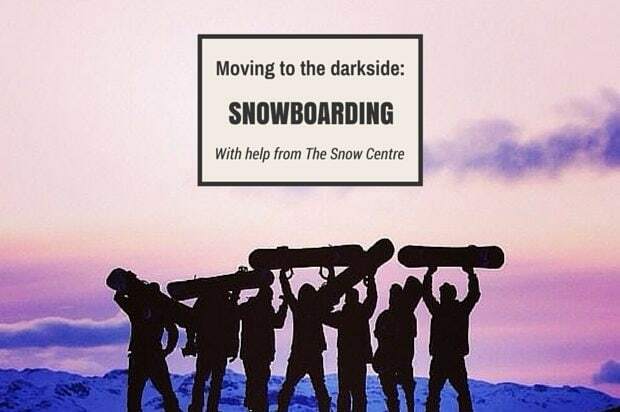 Find out more about that evening here. With my jeans already feeling tighter after the first day of food, I’d told myself breakfast at Cameron House would mean a light meal. A yoghurt with fresh fruit perhaps. Multi-award winning Cameron House on Loch Lomond is Scotland’s finest five-star luxury resort. Complete with gorgeous spa (which you can see in this vlog), gym, water sports on site and a seaplane!, Cameron House is an attraction in itself. My plan of yoghurt and fresh fruit all went downhill the moment I walked in to the breakfast room at Cameron House hotel and saw the menu. Whilst I knew a full Scottish breakfast would be a bit too much, the Scotch pancakes with maple syrup and locally produced bacon found there way in front of me. There’s always room for pancakes. 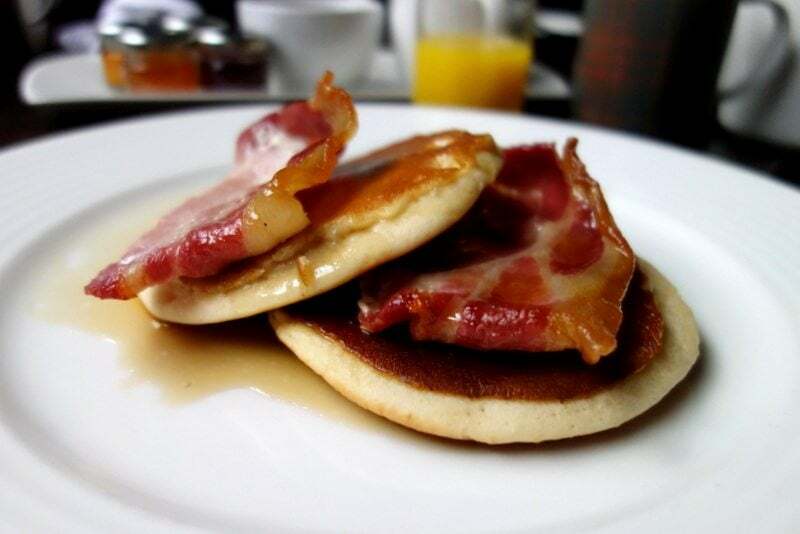 Warm and fluffy, smothered in rich maple syrup and crispy bacon and washed down with a pot of coffee, I had no regrets. 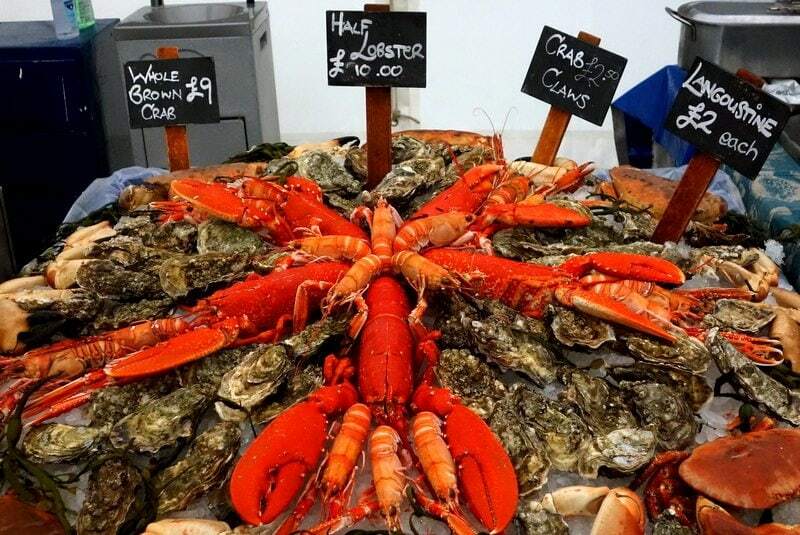 The Loch Fyne Food Fair in Argyll celebrated its 25th anniversary this year. Beginning in 1990, the Food Fair is the longest-running outdoor food event in Scotland. Working closely alongside local producers there were plenty of seafood stands, meats, coffee, rare breed scotch eggs and more. We sampled a few tasters while chatting to local producers whose passion for great food was infectious. The Food Fair is next to the famous Loch Fyne Oyster restaurant which we stopped off at for lunch. Loch Fyne Oysters started with one simple idea: to grow oysters in the clear, fertile waters of Loch Fyne. 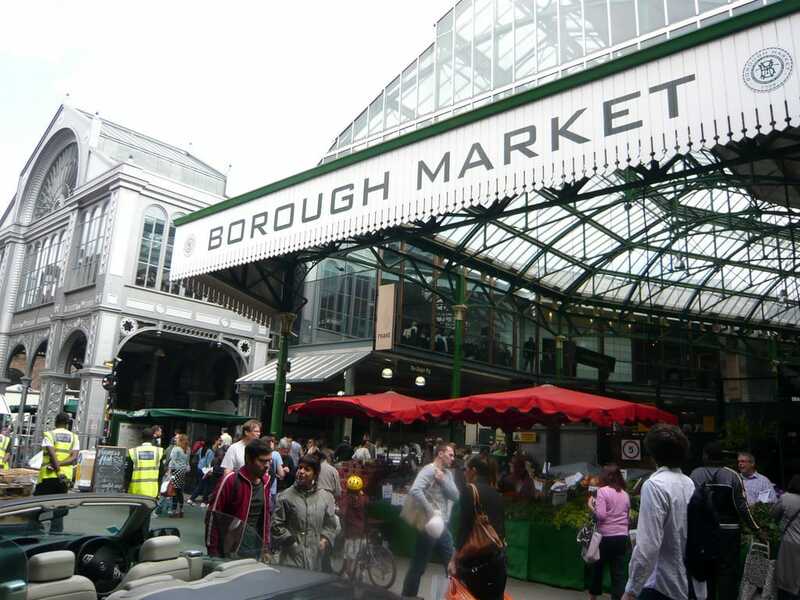 It started with a simple stall where fresh oysters were shucked and served to passersby. It’s since grown into a cluster of businesses who are committed to quality food. Alongside the smokehouse and shellfish farms at the head of Loch Fyne are the Loch Fyne Deli & Oyster Bar, where we had our dinner. We were led to a gorgeous room with a wall of glass windows looking out on to the hills. Lunch was another seafood treat. 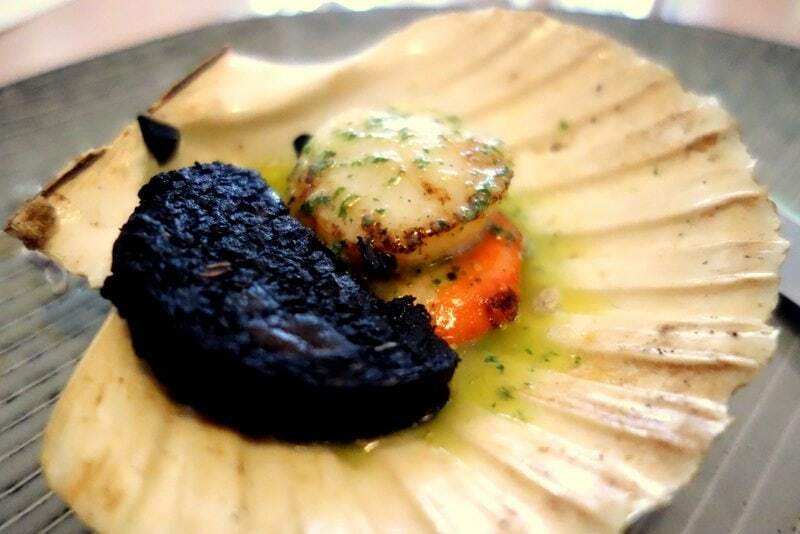 It consisted of huge oysters, both raw and crispy, massive scallops with black pudding and richly smoked slices of salmon. 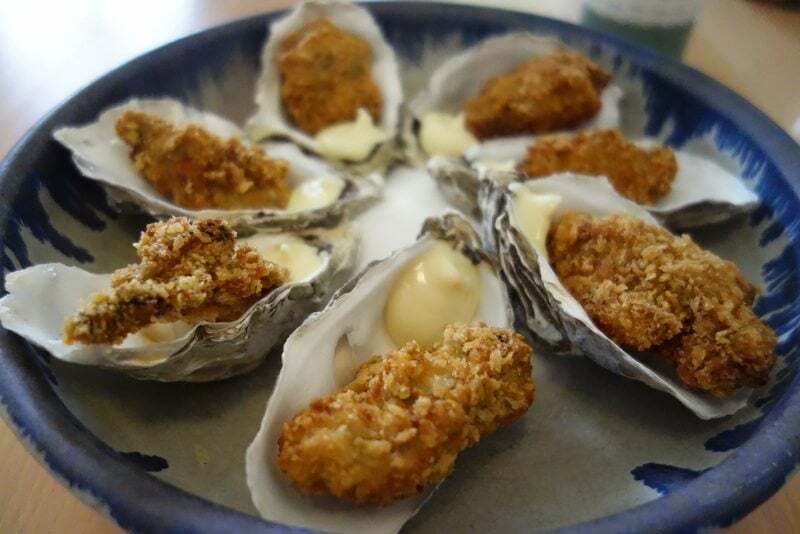 Crispy oysters are oysters cooked in a batter, if you’re not a fan of oysters on their own, I’m sure you’ll find these with a bit of tartare sauce tasty. 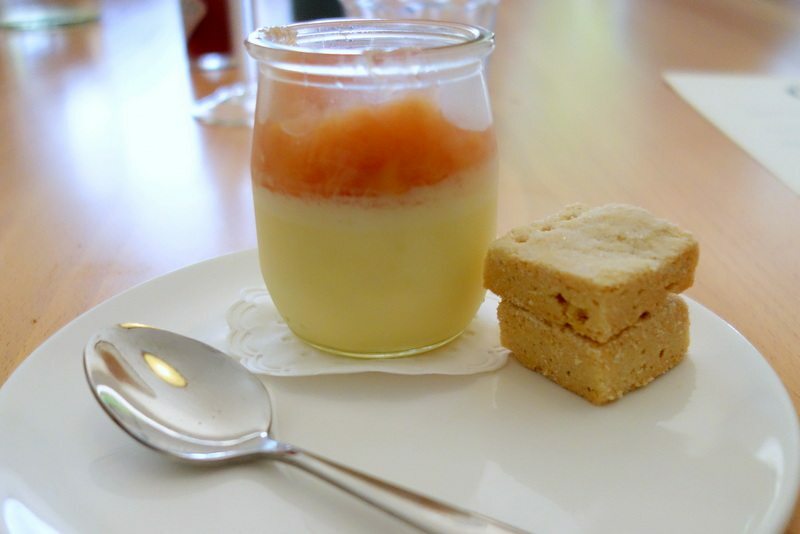 Dessert consisted of a crisp Scottish shortbread and refreshingly creamy lemon and rhubarb posset. The same people responsible for the great Riverhill Coffee Bar in Glasgow, have now opened up their first restaurant in Glasgow’s city centre. In an area surrounded by chain restaurants, The Riverhill is making waves in Glasgow’s blossoming foodie scene. 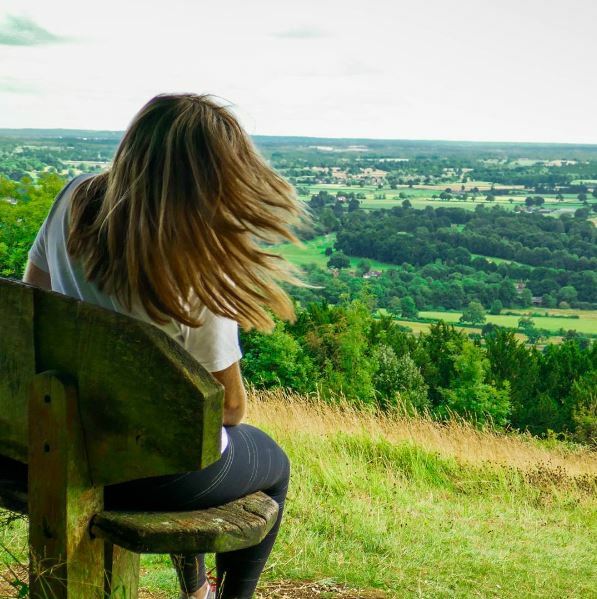 The menu at Riverhill Restaurant & Bar makes use of fantastic local produce to create inventive, fresh takes on well known dishes, and branches out to include more adventurous combinations too. Seared onglet steak with charred purple sprouting broccoli and braised rabbit gnocchi are just two examples. The breakfast menu is exciting with offerings such as; potato stuffed naans, huge portions of skillet eggs, and, of course, a full Scottish breakfast. 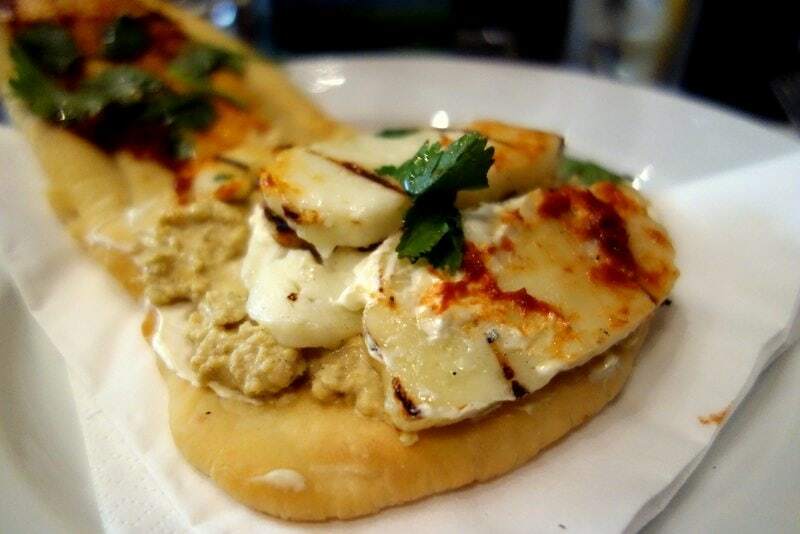 I opted for a halloumi and houmous flatbread – always a fantastic combination in my eyes. We had the opportunity to chat to the owner over lunch and his passion for supporting local producers, providing fantastic food and introducing people to new flavour combinations won us all over. It’s that that I love about great food & drink; the passion from the people producing these dishes, the simple ideas that benefit many people and the value put on sustainability. You don’t get that with chains and that’s a same. More countries need to celebrate food and drink in the same way Scotland is. In the meantime, head up to Scotland yourselves, it’s closer than you think, and with food like this you don’t want to miss out! Mouth. Watering. Booking. Return. Tickets. Now. This look mouth wateringly good! And that treehouse ? The treehouse was so gorgeous! They mainly use if for weddings – such a picturesque place! 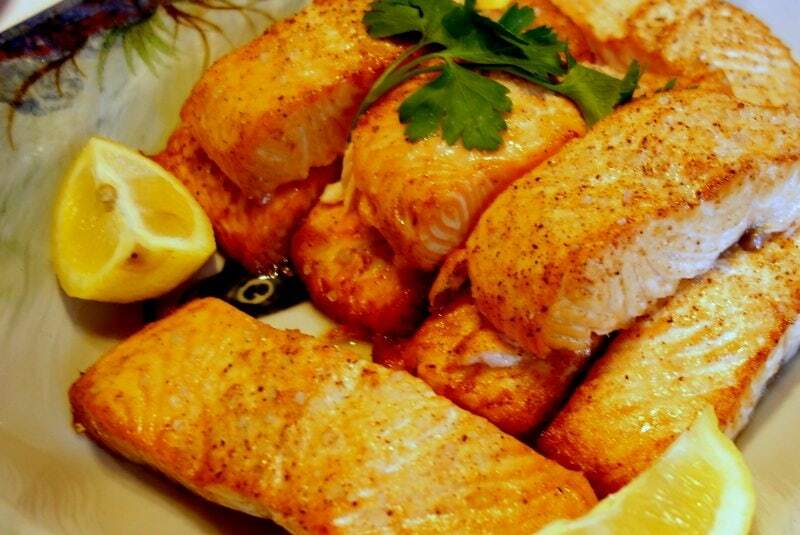 All that seafood… ah, I love it! I sometimes really miss having fresh seafood, now living inland, and the photos you have here are terrific. Thanks Jenni – the seafoood was so delicious! Never thought I’d become a fan of oysters either! I would never guessed that Scottish food would look so yummy:) thank you for showing me wrong. You know, so many people call the food in Scotland…batter Mars bar for example! But the reality is so much different than people imagine. So many lovely things! You’re so right – so many lovely Scottish dishes! Oh my goodness this food! I will go just for the food!!! Ahhhhh!